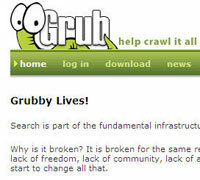 Wikia co-founder Jimmy Wales waded deeper into open source territory today as his company announced it had acquired Grub, a distributed search project. Financial terms of the acquisition were not revealed. Another step in Wales very public threat to take on Google in the search field. Its very interesting to note that wikia is currently displaying Google Adsense Ads. And we all know this is same kind of gas Jason C is going to fuel his Mahalo with.